Nelson Lawyer: Did Explosive Packages Delay Mail-In Votes for Democrats? 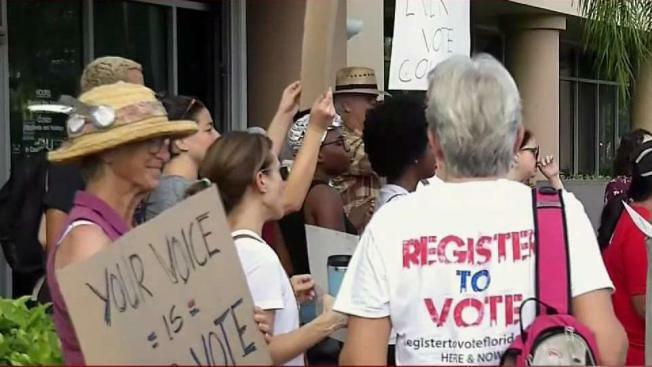 NBC 6 has team coverage from Broward, Miami-Dade and Palm Beach to report on the details related to the election recount and the accompanying protests. A lawyer for Democratic U.S. Sen. Bill Nelson said the campaign is investigating whether vote-by-mail ballots intended for Democratic leaders weren't delivered on time because they were handled by the same U.S. Postal Service facility that processed explosive packages. Marc Elias said he's concerned about news reports that ballots in an Opa-locka postal facility may not have been delivered before the 7 p.m. Election Day deadline. Opa-locka is in Miami-Dade County, which tends to heavily support Democratic candidates. "I would hope that we can all agree, I would hope that even folks on the other side of the aisle would agree that no one should be disenfranchised because the postal service, for one reason or another, was unable to deliver ballots," Elias said. A 30-count indictment was handed up recently in Manhattan federal court against 56-year-old Cesar Sayoc of Plantation, Fla. Authorities say he sent improvised devices intended for numerous Democrats, critics of President Donald Trump and CNN. None of the devices exploded and no one was hurt. Elias' comments come as the Florida Secretary of State called for recounts in three key statewide races Saturday.